If you have seriously started gardening, then sooner or later you will have a question: Which water is better to water plants. The best water for irrigation is rain water and snow melt, lake, river. But if you can not constantly get that water, the question arises: how to soften hard water? If you collect rain water, it is necessary to collect in large vessels for stagnant water from a barrel is not suitable. The easiest method of softening tap water with filtration through household filters and subsequent boiling. But, here there are drawbacks. Not always recommended to water plants with this water as it is devoid of oxygen. But still, if other mitigation options for You is not available then water should boil. You can also make the water softer by adding a special agent to neutralize the stiffness that you can buy in the store. After claim water for a few hours and drain the lower layer of this. The water is ready for irrigation. To mitigate may use chemicals containing acids, e.g., oxalic acid. However, for this You should know the water hardness and to calculate the dose. One of the good ways to mitigate the carts, which is perfectly demonstrated in the home is the freezing of the water. The technique of the freeze is to various speeds of freezing water crystals and impurities of the salts contained in the water. Therefore, this process gives a positive result only with proper freezing. If you just freeze the water, all the salt will turn to ice, and thawing again mixed with water. Starting to freeze, follow the process. The salt will freeze last and when non-frozen liquid will remain low, drain it. Drained water and will represent a saturated saline solution, and melted ice – melt soft water. Otherwise, the freeze does not make sense. For watering outdoor plants (for the room it will not do) the water can soften by adding 0.5 teaspoon of borax. The best way to neutralize the hardness of the irrigation water is adding wood ash or fresh peat. To do this, add per liter 3 grams of wood ash. If using fresh peat, the proportion of 100 grams for 10 litres. For plants water is the source of life and healthy growth. The need of plants in water depends on the structure of stems, leaves and root system. For example, cacti can do without water for a very long time. And begonias in the summer need to be watered almost every day. 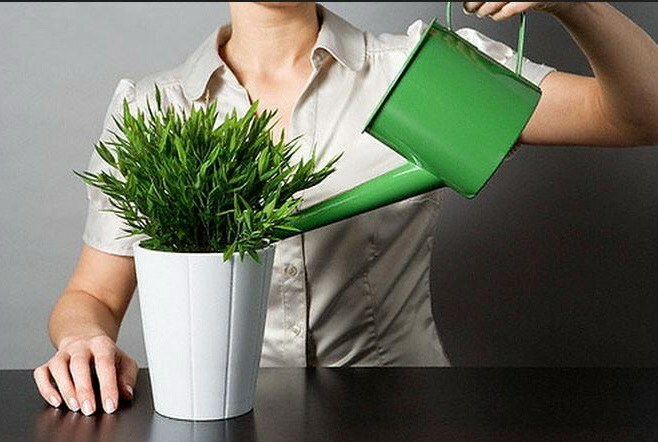 Use water for watering plants only in good quality. Acid-base composition should be neutral. It is desirable that the water does not contain harmful impurities such as chlorine, fluorine, salts of heavy metals. For example, the pH of drinking water varies from 6 to 9. Water acidity or pH for watering flowers must be from 5.8 to 6.2. Measure pH by using special tool. Increased or decreased acidity of the water can badly affect the health of the flower and even lead to his death. Low water hardness is another important indicator of its quality. On the rigidity of the direct influence of calcium and magnesium contained in water. Do not use for watering too hard water. There are several ways to soften the water. First, before the irrigation water it is desirable to stand for 1-2 days. Secondly, hard water should be boiled, then it becomes softer. 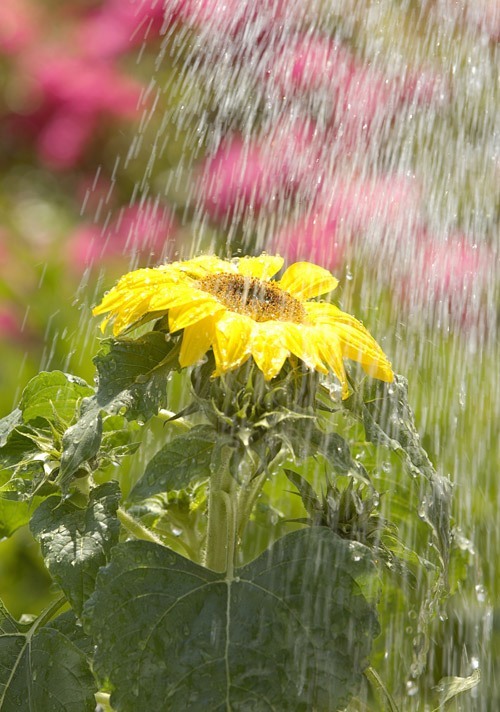 Third, the use for irrigation is rainwater or snowmelt water. Fourth, podkislit water peat. You can also acidify the water with citric acid. Consumption: 4 grams per 10 liters of water. If funds allow, podkislit water say. Fifth, to soften water, you can use various chemicals. Sixthly, use a water filter that contains ion exchange resin or osmotic membrane. There is an opinion that flowers should be watered with club soda. It is false. In the mineral water contains carbon dioxide. But the oxygen in it no more than in ordinary water. You need not buy mineral water and ordinary drinking in five-liter plastic bottles. If you don't know when you need to water the flowers, look at the surface of the soil. Dry land suggests that the plant should be watered. Some plants grow well on dry soil. In this case for irrigation, the land should be dry not only on the surface, but somewhat deeper. Water your plants early in the morning or evening. In the summer watering plants more frequently and in winter less. Remember that each flower is individual the need for watering. For example, tsiperus needs to grow on soil that is constantly too wet. But plants-succulents, on the contrary, in winter, almost no watering. Never water plants with cold water, only room temperature. Otherwise the plants get sick, they rot the roots that fall off the buds and so on. Use for watering watering can with a narrow spout. With the help of this spout is convenient to get to the roots of the flower. During watering the water jet should be pointing down. The liquid should fill the distance between the edge of the pot and the soil level. After watering, the water should seep into the pan. If not, repeat the watering again. After 30 minutes empty the water tray. If you sprayed the plant, be careful that it does not get direct sunlight. Water drops on the leaves are like small lenses. They will certainly burn the plants.